I have always thought of this chair as an elder's chair... for old people who did not really like rocking. I had always assumed that either someone decided to make a rocking chair stable by cutting off the rockers... or someone decided to put rockers on such a chair. I had also always assumed that the extended arm rails were there to accommodate, not just resting arms, but crafts, food, chores or kids. And yes, they are such nice lounge chairs too. 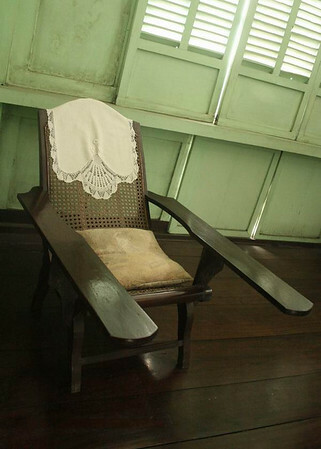 So, imagine my surprise when, in a tour of Jalandoni House in Bacolod, I was informed that this is a birthing chair. It was designed to sit pregnant women comfortably... and then double as a birthing chair. The extended arm rails are there to support the legs! I thought to blog about it here because it really spoke to the Waldorf mom in me... that once upon a time, Filipinas gave birth sitting up... and that there were these chairs that evolved with a woman's needs, cradling her as she goes about her roles. It's a little sad that it became more popular as a siesta chair when it used to serve a higher, more noble purpose. Weird as it may be, I have a newfound respect, nay, reverence, for this chair. After much Googling, I found the term the guide used: BUTAKA. Oh I've seen those chairs in relatives' houses too and didn't realize that's what they were for! Yup, we have a butaka in our house. we have lots of "old" furniture- but they aren't antiques- more like re-creations. They are bitthing chairs and ours even has an "extension" underneath which you can slide out so you can lounge in it.